We had a lovely BBQ at a friends last Saturday. I wanted to take a dessert that was gluten and dairy free that the kids would eat. Having never made an apple crumble before I decided to convert one. I made the filling in the normal manner - 2kgs of Granny Smith, sugar, cinnamon simmered lightly then popped in the dish with the topping and baked. The topping is usually the bit with the gluten and dairy in it. I mixed coarsely ground almonds, nuttlex, brown sugar and coconut. It was really yummy. Of course, Mr TBT enjoyed it smothered in icecream!! What's the best desert you've had recently? 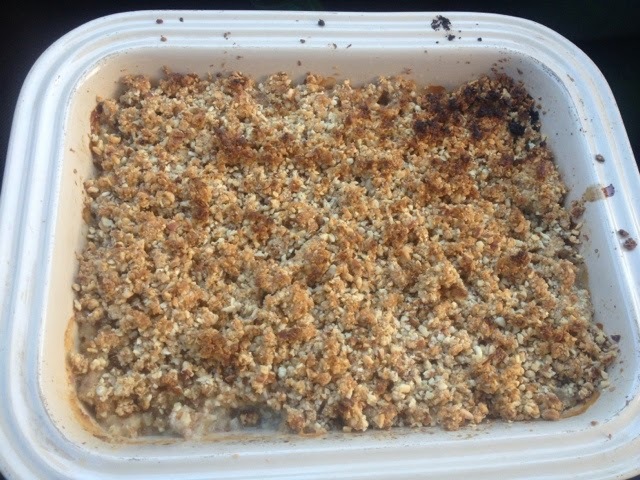 Oh wow - I love crumble and this looks delicious! This is such a tough question, I'm not usually a dessert-lover! But the nicest one I had recently was a vegan dark chocolate tart with a jammy centre and avocado ice cream. So good! I was with you on the dark chocolate and jammy bit....avocado icecream? Really? I guess avocado and icecream are 2 of my faves, why wouldn't they go together!